The successful Australian ‘Hailstorm Heroes’ marketing campaign to help sell marked fruit is back to sell apples and pears impacted by a major South Australian hailstorm in October 2017. The campaign uses marketing to promote the purchase of blemished fruit impacted by hailstorms to stop the fruit from going to waste and costing farmers. Hailstorm Heroes was first successfully used by Apple and Pear Australia Limited to help sell blemished fruit in 2016 after two hailstorms hit the Goulburn Valley region. The campaign is now being returned after a severe hailstorm hit the Adelaide Hills and South East SA in October 2017. Horticulture Innovation is driving the campaign with assistance from SA Apple and Pear Association, retailers, primary industries and regions SA and Brand SA. Fifth generation apple and pear grower, Brett James, said his Kersbrook orchard was hit three times by a battering of small hail during the night of the October storm. “The fine hail was the size of rice grains and went straight through the hail net, covering all the trees and marking the skin of small fruit that was starting to grow,” James said. 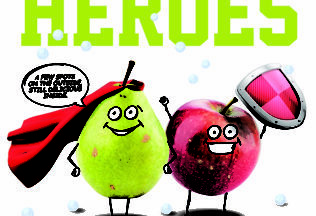 Hailstorm hero apple and pear packs can be purchased from Coles, Foodland, IGA and Aldi. Woolworths will sell Hailstorm Heroes fruit through its Odd Bunch range and the fruit will also be sold in packs and loose at some independent grocers.